Don’t do this! Feeding your baby in a stroller or car seat increases choking risk. Your baby choking on food while learning how to eat is a rare - but real - risk. I surveyed my audience asking for real life choking stories, and the many responses I received were eye-opening and at times harrowing. I’m sharing a few of these stories below - but for context I’d like to first briefly address BLW and choking risk. Published research supports the idea that babies who start solid foods using a baby-led approach to feeding are at no higher risk of choking than are traditionally-weaned, spoon-fed babies. The caveat with this research, however, regards education. 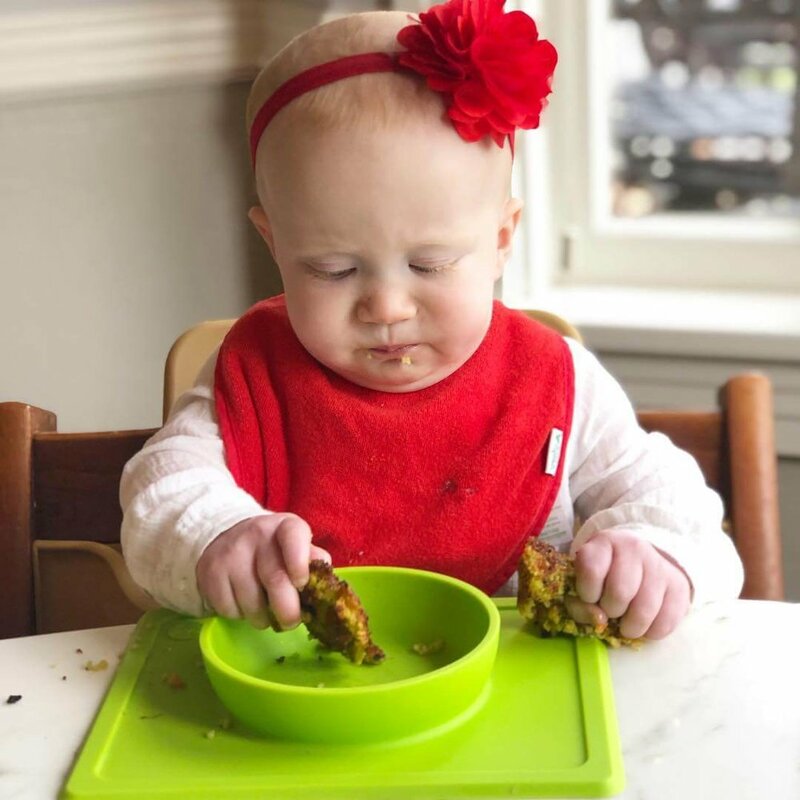 The studies show that parents who are educated about avoiding choking risk foods and unsafe feeding practices and THEN start solids with baby using baby-led weaning are unlikely to have more choking incidences than spoon-fed babies. The key is education about choking risk, which is the overarching theme of this post. Knowing what foods to avoid and what feeding practices to avoid are important for ensuring safety in feeding. The American Academy of Pediatrics (AAP) states that approximately 50% of choking incidences in babies occur from food. One large choking study analyzed data from more than 12,400 children ages 0-14 who were admitted to the ED for nonfatal food-related choking. Researchers found that most of the foods that cause choking are things like hard candy (15%), other candies (13%), meat other than hot dogs (12%) and bones (12%). Other high-risk foods include things like hot dogs, seeds and nuts, and these are more likely than other foods to cause hospitalization for infant and child choking. Recently I asked my audience if they would share any first-hand experiences they have with babies choking on food. The responses were overwhelming - and in most cases difficult to read. But I appreciate all of the respondents’ openness and honesty as well as their willingness to share their frightening experiences to help others avoid ever having to experience the same. The point of sharing these stories is not to place judgment on the parents or the feeding practice that caused choking, but rather to serve as an opportunity for educating all of us about how easily choking can occur, and what we can do to prevent it. The parents and caregivers who told me about their choking experiences have authorized me to retell their stories here. One mother shared her story about her then 3-year old who grabbed and ate a grape at a restaurant before she had a chance to cut anything up. Mom started the Heimlich but could not dislodge the grape. She asked someone to call 911 and her husband took over. When Dad attempted the abdominal thrusts, he was able to get the grape out and the toddler threw up in the middle of the restaurant. “We still get sick to our stomach thinking about it,” mom shares. 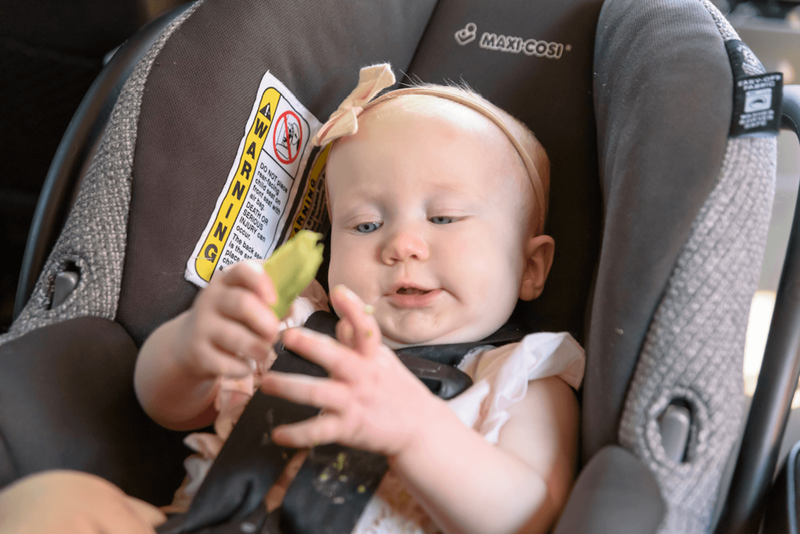 And her story shows that while most of us are aware that intact grapes are a choking hazard (one of the biggest hazards, even for older kids), an agile baby or toddler can swipe and choke on a grape in a split second. If you are serving grapes or cherry tomatoes to baby, cut them in quarters. Even for toddlers, continue cutting grapes or cherry tomatoes in half, and never let children run around while eating grapes (or any food for that matter) as this greatly increases choking risk. A friend of mine and a fellow dietitians shared that her son who was about 9 months old was eating leftover pasta she was serving from a container. Mom didn’t realize there were garbanzo beans in the bottom of the container and the baby had a silent choke. Should she not have continued trying to feed her baby solid food after this event? This story demonstrates the importance of knowing what to do in the event of a choking risk. Both parents were familiar with infant CPR, and their knowledge of how to administer back blows likely saved their son’s life. Furthermore, the culprit food was an intact garbanzo bean. Foods of this size are the perfect size to block a baby’s airway. 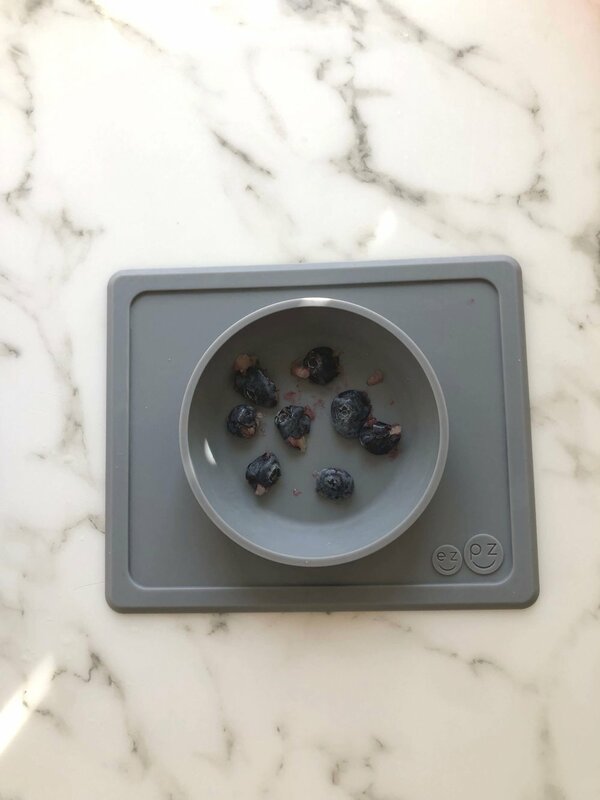 When feeding foods like garbanzo beans, kidney beans, black beans and blueberries, smoosh them with your thumb or fingers to flatten and then serve to baby. These foods are great ways to practice baby’s pincer grasp (which usually develops from ages 8-12 months), but I don’t love them for early eaters (6-7 months of age) because of the choking risk. There is no urgency or hurry to introduce foods like this if you feel more comfortable waiting. For garbanzo beans I also recommend slipping the bean out of the skin to further reduce choking risk. Another new mom, also a dietitian, says she just had one choking incident, but it was terrifying. At the very beginning of doing baby-led weaning with her baby, baby choked on a strawberry. This story drives home the point about high chair safety. The safest way to feed baby is in a high chair with a foot rest. The foot rest helps support baby during feeding and facilitates the muscle control needed to safely swallow food. Avoid dangling feet, and if baby can’t reach the high chair foot rest yet, construct a makeshift footrest using a cardboard box or other similar support. When it comes to straps, it may seem counterintuitive but with some chairs it is safer NOT to strap baby in at first. When you start solids at 6 months of age, baby isn’t crawling or able to climb out of the high chair. It is more important at this phase to be able to quickly remove baby from the chair (without straps) in the event of a choke. Check your high chair to make sure baby isn’t slumping down. Use props such as rolled up towels or receiving blankets to support baby early on if needed. 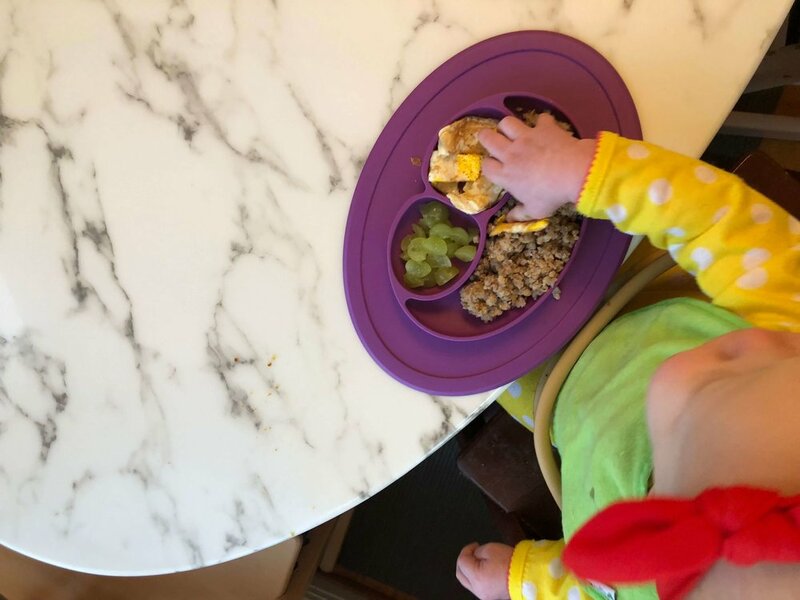 If you use the Stokke Tripp Trapp high chair, use the plastic baby set without 5 point harness at first, and then use straps when baby is older, more confident at self-feeding and more likely to need the harness straps for restraint. Kristy is a mom who tells about her choking incident with a rice cracker when her baby was 8 months old. Her baby began coughing and turning between red and purple in her face after ingesting the rice cracker. Mom was watching for a few seconds to see if baby could recover on her own, waiting to see if perhaps it was just a gag baby could overcome by her self. When the baby continued struggling, dad intervened. He took the baby out of her chair and placed baby so she was facing the floor with head lower than her body. Kristy’s lesson teaches us that foods that appear harmless - like a rice cracker - can actually be a choking risk. Dry crackers and dry meats are particularly problematic because they get “stuck” in baby’s airway. Whenever possible, add moisture, sauces or dippers to make dry foods like meat or crackers easier to handle for baby. This also helps facilitate more saliva inside of baby’s mouth, which further facilitates safe swallow. Another mom shared a story about her oldest, who is now 2 years old. When he was 7 months old he choked on a yogurt puff. Puffs are the perfect size to block a baby’s airway. When starting solid foods it is best to avoid circle-shaped foods (like puffs) and stick to longer, spear or strip-shaped foods (think about the size of a fat french fry). Many parents start food with puffs, thinking they are safe. Puffs become slimy and can become lodged in baby’s airway. There are much safer foods to start with that do not pose a choking risk, and also that are cheaper than puffs and provide nutrition whereas puffs are essentially white bread + air. For ideas on some safe solid foods to start feeding baby, check out my instagram page @babyledweanteam. Her husband yelled to the mom, she returned, picked baby up, laid her across the adult’s arm (chest-side down) and gave her two back blows until it came flying out. Choking can happen anywhere and on any food, so vigilance and attention from caregivers whenever food is offered is essential. Hard candy is a huge choking risk; parents often tune out to this if they are feeding babies since babies don’t eat candy….but that same baby is going to eventually be a toddler, and toddlers LOVE candy. Keep kids away from hard and even certain chewier candies because of choking risk. Research whether the people responsible for your caring for your children are CPR certified. Many daycare and school-based settings go above and beyond by requiring all caregivers be certified, and these are your safest options. One of my friends (real-life friend, not an instagram friend :) shared that she has had 2 choking incidences, one with each of her 2 sons. READ: IS THERE SUCH A THING AS A SAFE CAR SNACK? Thank you again to all of the brave parents and caregivers who shared their stories here. 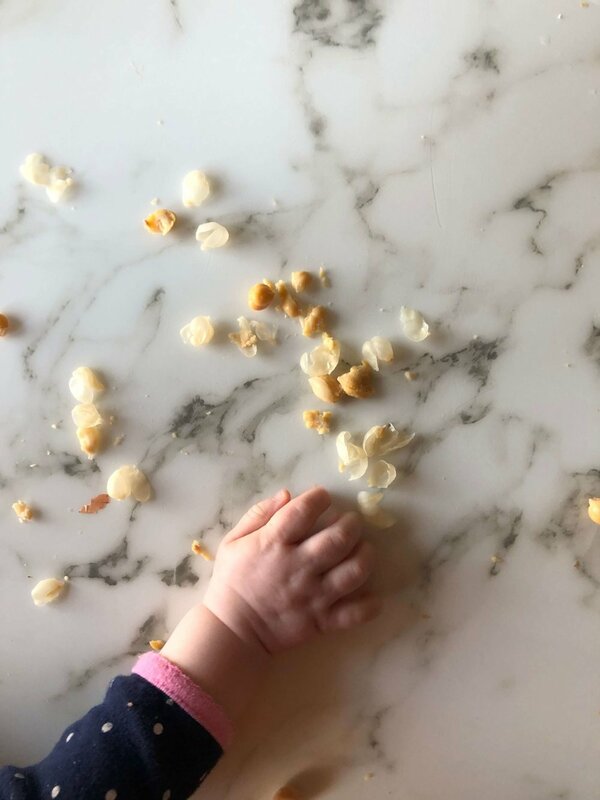 We all learn more from our collective experience and I hope this post contains information that helps you establish a safe feeding environment during infancy (6 months+) and beyond.